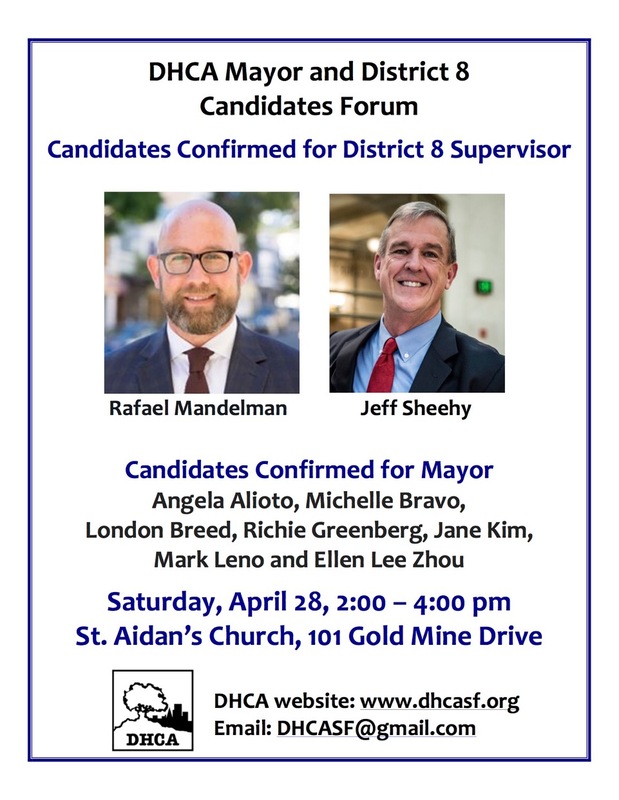 The Diamond Heights Community Association is delighted to invite the public to its Candidates for Mayor and District 8 Supervisor Forum on Saturday, April 28, 2:00 to 4:00 pm at St. Aidan’s Church. Candidates for Mayor that have confirmed attendance are Angela Alioto, Michelle Bravo, London Breed, Richie Greenberg, Jane Kim, Mark Leno and Ellen Lee Zhou. Candidates for District 8 that have confirmed attendance are Rafael Mandelman and Jeff Sheehy. The election for Mayor and District 8 Supervisor is scheduled for June 5, 2018. We are a neighborhood organization organized in the 1960’s when the San Francisco Redevelopment Agency created the model community of Diamond Heights. The Agency mandated that planning in the neighborhood be coordinated with the neighborhood organization. The DHCA is incorporated as a Section 501 (c) 4. San Francisco Public Works will be performing the remediation of the failing pavement area on Diamond Heights Blvd. between Duncan St. and Clipper St. This work is urgent as the pavement has failed and needs to be repaired immediately. We will be reconstructing a portion of the three lanes on the Diamond Heights Blvd. between Clipper Street and Duncan Street. At least one traffic lane will be provided at all times and no detours will be required. Parking will not be affected. · Tuesday – reconstruct the remaining lane nearest the median. · Wednesday – pave with 2” asphalt. If you have questions, please feel free to contact me. Thank you. 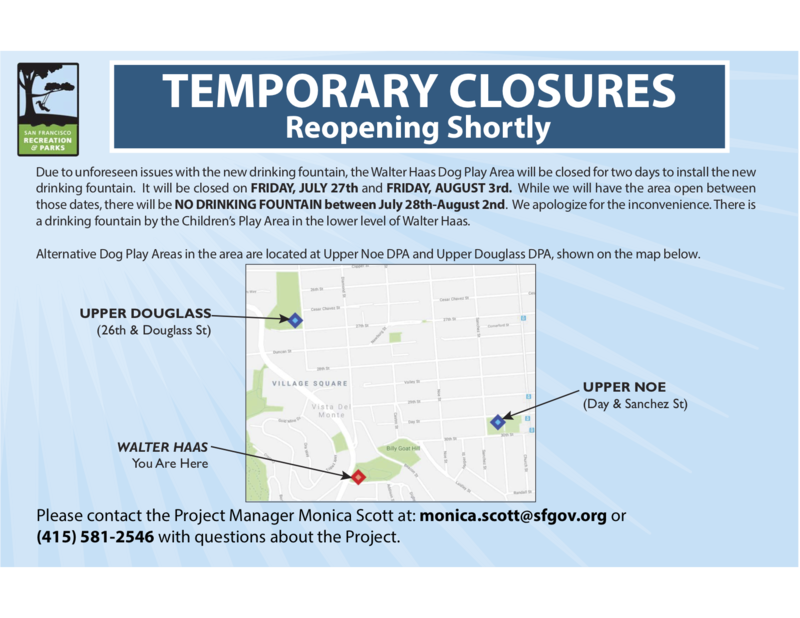 Due to issues with the new model of drinking fountain, the Dog Play Area at Walter Haas will have to be closed for two additional days to properly install it. It will be closed Friday, 7/27 and Friday, 8/3. While it will be open from 7/28-8/2, there will be no working drinking fountain. The Dog Play Area will reopen completely, with no future anticipated closures, on Saturday, August 4th”. In the coming weeks, the same crews will complete the remaining paving for the Diamond Heights Improvements Project between Berkeley Way and Sussex Street (alongside Glen Canyon Park). Please expect delays and allow extra travel time. We apologize for the inconvenience. Please share with your residents and friends. Please join RDH for a simulation of opening St. Aidan’s as a Heat Wave Relief Center when temperatures soar above 85 – 90 degrees for two to three days in a row. Dinner at 6:00 pm will be followed by the drill in which each person will have a name tag and role either as volunteer staff implementing the Incident Command System (ICS) or as guests. The ICS is used nationally by first responders so that response and communications are coordinated among police, fire fighters and paramedics. ICS use is suggested for nonprofit groups involved in disaster resilience planning. We will have props, safety vests and equipment to help with the role playing. The drill will be a great way to improve the RDH plans for activating not only a heat wave center but opening for other emergencies as well. Please reply if you plan to attend so that there will be plenty of food for everyone. You are invited to come and participate in this discussion with us. We welcome your comments and views. Performing works by Astor Piazzola, Julian Peralta, Astillero, & Diego Schissi are Charles Gorezynski, bandoneon; Elyse Weakley, piano; Anton Estaniel, cello; Ishtar Hernandez & Mia Bella D’Augelli, violins; Daniel Fabricant, double bass. The concert will take place at St. Aidan’s Church. Tickets are $20 general & $15 for students and seniors. For more information or to purchase tickets onlinelog on to www.musiconthehill.org/tickets. You can email us at: mothmuse2@yahoo.com. Please Vote for District 8 Funding for Diamond Heights and Glen Park Projects! Please vote for the Diamond Heights and Glen Park projects listed below to help improve our neighborhoods. Information on each project is listed in the voting link https://sfpbd.sfgov.org/district/8/ballot and in the additional information below. Please forward this email to your friends, neighbors and email lists to help spread the word on this important funding opportunity provided by Supervisor Jeff Sheehy and the City. We need your votes! Please vote for the following. You may vote for up to 10 projects in District 8. Voting ends on May 1st at midnight. Thank you in advance for voting and spreading the word about this funding opportunity! SAN FRANCISCO—At 12 PST, Wednesday, April 18th, 2018, voting for District 8 Participatory Budgeting Proposals went live. Click here to vote on your favorite Participatory Budgeting Proposals . Participatory Budgeting is a democratic process that gives community members the opportunity to set budgeting priorities and make decisions on which community projects should be funded. District 8 residents will be able to help decide on how best to spend $250,000 for neighborhood enhancements, beautification, safety, open space and other improvements. All District 8 residents 16 and up can participate in the voting process. Non-U.S. Citizens, regardless of immigration status are also invited to participate in the voting process. First and last name, address and birthdate must be provided on the ballot in order to vote. Diamond Heights and Glen Park Projects – Please help us fund these projects! Thank you! Resilient Diamond Heights has been working for 9 years to develop training and plans for the neighborhood to remain resilient after a disaster. Funding will provide supplies for the NERT staging area, a cooling center for heat wave relief, for a Neighborhood Support Center and for emergency kits for vulnerable people. Training and templates for emergency plans will be developed for the 13 housing complexes that include 550 units of affordable housing focusing on checking on seniors, those that live alone and people with disabilities after a disaster. 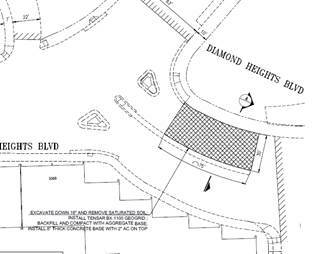 Diamond Heights Safety Wall: Help bring to life the entrance to our neighborhood! The SF Arts Commission, Public Works and SF Planning have agreed to work together on preserving this important artwork created in 1968 as a gateway to Diamond Heights. With its upcoming renewal and restoration, this sculpture will look beautiful again and we have a chance to make it shine even more. The lighting will not only accentuate the interesting sculptural details it will also help brighten and make safer an otherwise dark strip of sidewalk. It can become a safe beacon at night for pedestrians. We live in a very special neighborhood and we’re fortunate to have a sculpture at its entrance! If the lighting is approved, visitors would always know they are entering Diamond Heights, no matter what the time of day. Glen Park Greenway Boundary Survey: Help continue improving the walkway from Glen Park Village to Glen Canyon Park. The walkway is fabulous thanks to planting efforts by many volunteers of all ages. Support is needed for this volunteer effort! We are incredibly excited to announce the date of the dedication for California Historical Landmark No. 1002! The grand dedication ceremony will be held on Saturday, April 21, 2018 from 1:00 pm to 3:00 pm. We will convene in the Auditorium of the Glen Canyon Park Recreation Center. In March 1868, the Giant Powder Company began operations in what today is the site of San Francisco’s Glen Canyon Park Recreation Area. The operation was the first dynamite factory in the United States and was personally licensed by inventor Alfred Nobel. It is our link to the most prestigious award in the world, the Nobel Prizes. West Historical Preservation Foundation and Twin Peaks Parlor No. 214 who generously donated the funds to purchase the plaque. 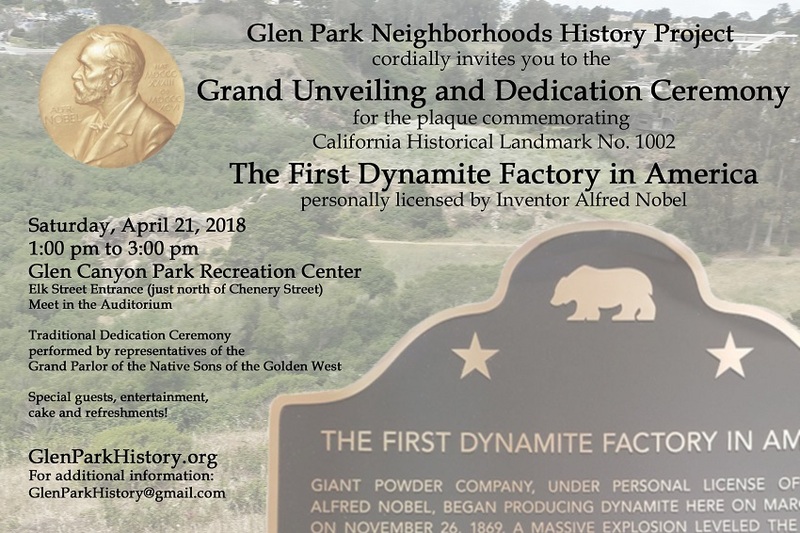 The San Francisco Recreation and Parks Department is graciously constructing the concrete pedestal to hold the plaque and is providing use of the Glen Canyon Park Recreation Center for the event. To those of you who made a donation towards the plaque, we are grateful for your support in helping us complete the work Ms. Kortum began 27 years ago! After some opening remarks, we’ll move outside to the site of the plaque where the Native Sons of the Golden West will perform the same ceremony they have been using for over 120 years in over 1100 dedications, including many other state historic landmarks across California. The program will conclude with cake and refreshments. Be sure to download the announcementand mark it on your calendar! Here is a great opportunity to help spruce up Walter Haas Park in cooperation with SF Rec and Park on Saturday, April 14th, 9 am – 12 noon. Please see the message from Robin Lee, Friends of Walter Haas Park, about the Volunteer Day. Hello Neighbors – Happy Spring! Walter Haas Park Volunteer Work Day coming up!